Cut the chicken into 1 inch chunks, then in a large deep frying pan, brown the chicken in about 1 tbsp olive oil. Salt & pepper to taste. Transfer to a bowl and set aside. In a separate pot, partially cook your chunks of potato. Basically just boil it for about 2 minutes. Then drain and set aside. In the same frying pan that was used to cook the chicken, cook the onions, celery and carrots in 1 tbsp oil. Cook until soft, about 5 minutes. When the onions, celery and carrots are soft, add the thyme, bay leaf and flour. Stir while cooking for 1 minute. Then add the stock to the onion mixture. Bring the mixture to a boil, stirring constantly until the mixture thickens. This takes about 4 minutes. When the stock mixture has thickened, add the potato and chicken. 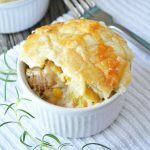 Transfer the chicken mixture into an oven proof casserole dish, or deep pie dish. Bake covered, without the crust for 1 1/2 hours. After the 1 1/2 hour baking time has passed, remove the dish from the oven, remove the bay leaf, then stir in the frozen vegetables and cream. Then add the thawed puff pastry sheet to the top of the pie dish, making sure to cover the edges. Using a knife, cut vents into the pastry (I like to put 2, 4-inch vents into my crusts). Bake for about 30 minutes more, or until the crust is nice and golden brown.